As many of you know, here in the lab we have a thing for rare stuff out of the Niobrara chalk. We've found the only articulated skeleton of Protosphyraena, described the giant filter-feeder Bonnerichthys, we make a habit of collecting excellent cephalopod mouthparts like Spinaptychus and Rugaptychus, and even discovered the only open coiled ammonite out of the whole formation. So when it comes to new giant coelacanths out of Kansas, yeah we're on that too! The first specimen of Megalocoelacanthus from Kansas was prepared by our lab in 2005. It was given the name "mystery fish" since the bones looked nothing like what we usually work with. The bone quality was pretty nice, and comprised a nearly complete skull. It was eventually identified by Dr. Ken Carpenter (at the Denver Museum at the time) as a coelacanth, and the specimen went off to a repository. While preparing and molding the specimen, I discovered a second specimen in 2007 much higher in the chalk consisting of a left lower jaw. As far as we know, these are the only two specimens of Megalocoelacanthus ever discovered in 150 years of paleontological prospecting in the entire Niobrara. From past projects, it is obvious that we are the only people crazy enough to do 3d restorations of Kansas fish. We had disarticulated casts of the whole head of this giant coelacanth, so why not attempt a restoration? Well, here's our first stab at it. In the future we're going to have to un-flatten the mandibles so they better fit the floor of the mouth. One thing is for sure though: it's still a strange fish even when all put together. Just finished a sort of long-term new project for us. Occasionally we get requests from museums and universities to come out in the field with us and collect specimens. Even more occasionally, we oblige. In 2011 a class from the University of Tennessee - Martin (actually 2 classes, one in geology, one in journalism) came out to our digsites in western Kansas to find and document fossils for a new museum project. TPI fieldcrews supervised and instructed, however we let the students do the finding. They came up with several neat little fossils (several Spinaptychus, a Chelosphargus partial skull, Martinichthys skulls) and lots of partial fish. On the second day, one student hit the jackpot: the tip of the lower jaw of a mosasaur poking out from just under the alluvium. Here, Aaron (the discoverer) works to remove overburden from the specimen. TPI does the same thing, though usually with fewer spectators. He decided to name the mosasaur "Kimberly". I've named specimens worse things I suppose. 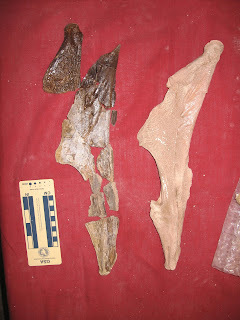 The specimen was tentatively identified int he field as Platecarpus planifrons. Though reasonably well articulated, it was missing the front limbs and everything back behind the mid dorsal vertebrae. UTM students preimetered, stabilized and jacketed the specimen. Most importantly they also carried the slab across the badlands to the nearest truck, which was great for me! Back in the lab, preperation was begun by UTM students under TPI guidance. Mosasaurs are usually pretty straightforward to work with, however this one presented a few challenges. The proximity to the alluvium meant that this specimen encountered some weathering back during the last ice age, and roots made matters worse. The prognosis was grim initially, as the bone and teeth looked to be in pretty rough shape. But careful consolidation and prep resulted in not only stable bone, but the discovery of the preserved remnants of tracheal rings, as well as extracollumnellar (ear) cartilage. At the rear of the left lower jaw, one of the scavenging sharks, Squalicorax falcatus, left its calling card. 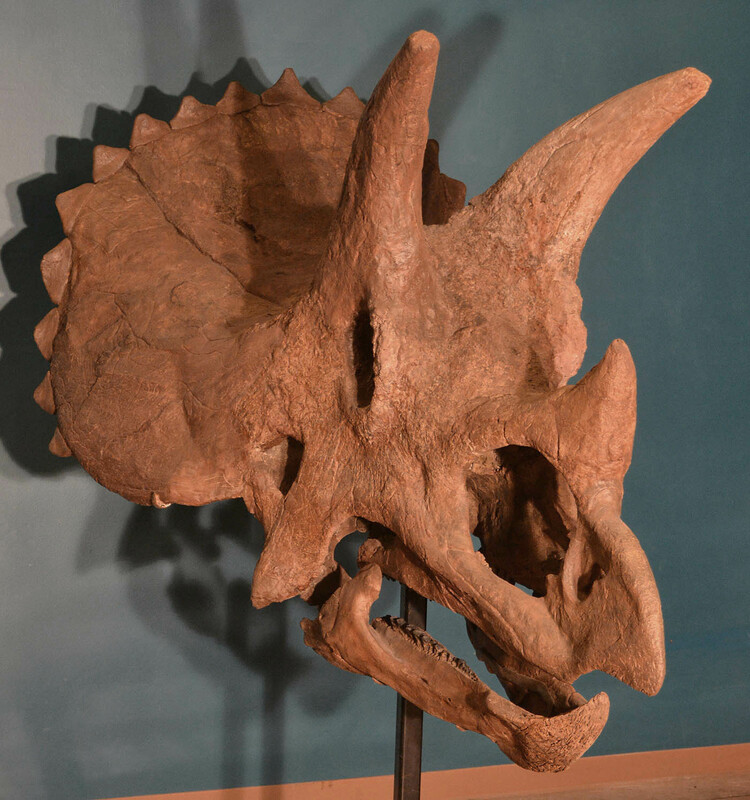 Next up the specimen will be delivered to the new museum in Tennessee, where it will go on display later this year. Luckily the whole process was documented by the journalism students, almost from the instant of discovery. If I see the video, I'll post a copy on the blog in the future. Not a bad little mosasaur.